Have you ever purchased an iron and been disappointed with its performance? Used an iron that left marks all over your clothing when you tried to use the steam function? Or perhaps you’ve borrowed someone’s iron, and it refused to glide over any garment leaving you helpless over those wrinkles that make anyone look disheveled? With hundreds of brands and models of irons on the market, it ‘s hard to differentiate between what is a good purchase and what will give you more headaches than the weather changing. What is a person to do when they need to choose a new iron but haven’t a clue where to start or what to buy? 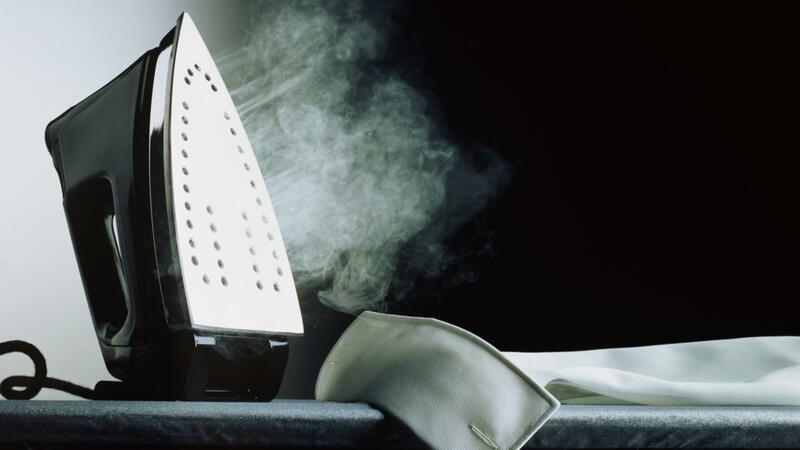 We’ve got you covered with the top 6 Best Standing Steam Irons on the market today. 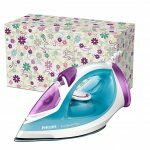 A sufficient standing steam iron should be secure when positioned on its heel and should also provide you with enough steam output to tackle even the hardest creases and wrinkles. With plenty of bells and whistles available, look for standing steam irons that have easy to read temperature settings, variable steam functions and characteristics like auto shut off and self-clean. 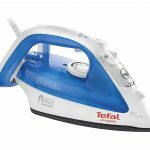 All within an acceptable price point that won’t break the bank, here are the top standing steam irons that have everything you need when ironing. This well-designed steam iron from Russell Hobbs has all the necessary features for a sturdy iron. 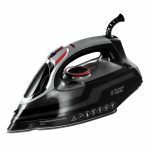 With 2600W, the Russell Hobbs 21370 Steamglide has enough power to heat up quickly and evenly, so you won’t have to wait long, to tackle that ironing pile. At 1.3kg, it is lightweight and easy to use and has good placement of the temperature control. The dial quickly moves from each setting allowing you to change temperatures with fluidity and the temperature selections are self-explanatory. With its soft grip handle, you will feel comfortable while ironing and you won’t have the normal hand cramping that happens with irons that have firm handles and grips. The Russell Hobbs 21370 has a non-stick ceramic sole plate that glides effortlessly over most fabric types and helps in retaining high heat. With variable steam settings, you will be able to moisten fabrics as needed. The continuous steam is 40g/min, and the steam boost is 145g/min. Both give you the proper amount to help get even the most stubborn wrinkles out. It also comes with an ample 300ml water tank that is easy to fill, but the opening could be a tad wider. The 21370 comes standard with an auto shut-off component and self-clean feature. Both of these features give extra longevity to the life of your iron. Lastly, this inexpensive iron comes with a 3m cord for easy maneuverability and anti-drip to protect your clothes from those annoying water spots. This iron is a solid purchase, and although the steam buttons are a little stiff, overall it performs very well. 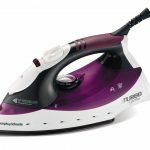 The Morphy Richards Turbo-Steam Iron is both inexpensive and reliable. The purple color is eye-catching, and the overall design works well. With 2000W of power, this iron heats up relatively quickly and weighs 1.2kg so easy to lift and move. It comes with a 2m cord which is a little shorter than some, but it still works well. The 400ml water reservoir is fantastic. It is larger than a lot of irons on the market, and because of the size, you can get through more ironing before refilling. It comes with a filler beaker as well to make refilling easier for you and the reservoir is very clear to read. It boasts 35g of variable steam and a vertical steam feature as well. What really makes this iron unique is the Diamond sole plate. This sole plate is infused with diamond particles that work two-fold. First, these little gems help strengthen the sole plate of the Morphy Richards Turbo-Steam Iron and create a scratch resistant surface. Secondly, the Diamond sole plate gives the iron exceptional glide and adds to a perfect finish on your garments. No more snagging, or grating your favorite trousers or blouse. The Morphy Richards Turbo Steam Iron comes with a 3-year warranty to help if anything goes wrong. This is a great extra perk! Not a bunch of extras on this iron, but it really makes ironing stress-free. A good choice overall! 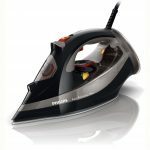 Russell Hobbs makes a variety of different irons and this is one of their most economical and reliable irons. With a whopping 3100w power supply, the 20630 heats up incredibly quick and evenly as well. It weighs 1.6kg and has a 350ml water tank has an adequately sized opening for refilling. It is clearly labeled, and because of the size, you don’t have to fill up as often when using steam. Speaking of steam, the 20630 Power Steam Ultra lays claim to 45g of continuous steam and a 210g steam shot. That gives you plenty of moisture to get rid of even the toughest creases and wrinkles. The ceramic sole plate provides smooth glide ability and has a precision tip and button groove to make ironing hassle free. If you live in an area plagued with hard water and lime, this iron will be a godsend! The Russell Hobbs 20630 contains a triple action cleaning system with an anti-scale cartridge that gets rid of that unpleasant build-up, so your iron won’t spit extra water, corrode around the steam holes or die out early because it’s plugged up! Its 3m cord gives you the option to iron almost anywhere, and the auto shut-off feature beeps when your iron is about to shut off. With the 3-year warranty, most problems that arise can be covered. On the whole, this iron is a solid bet to spend a few dollars for reliability. Philips has been making small appliances for decades so there had to be a few irons of theirs that would make our list. This blue and purple iron is a pretty elemental iron with no remarkable features, but for the price, it deserves a spot on the list. With 2300W the Philips GC2045 heats up to your selected temperature within 2 minutes. The ceramic sole plate offers no drag on your fibers and has efficient placing of the steam channels and dimples. With 35g continuous steam and 120g steam shot as well as vertical steam, you won’t have any issues trying to get rid of wrinkles and creases. It has a pointed tip to get into harder to reach areas like between buttons and in pleats and darts. The drip stop feature protects your most delicate fabrics on lower temperatures from unwanted water spots. The cord is a little on the short side at 1.8m so that you won’t have as much portability as some other irons, but it is sufficient. The GC2045 Easy Speed does have a smart scale clean feature that has both a slider and a reminder to descale. This process only takes 1 minute, and that saves time! For easy storage, once you are done tackling that ironing pile, the GC2045 comes with a heat resistant storage box. There isn’t an auto shut off feature on this iron, but it still packs a punch with the ironing. A sound investment overall! Coming in at number 2, the GC4521/87 Azur has all the benefits and features you need to attack that ever-growing laundry pile of ironing! It quickly heats up to the selected temperature because of the 2600W. 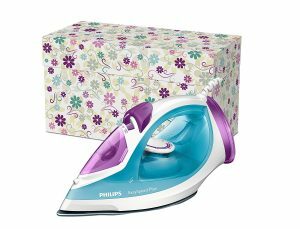 A moderately light iron at 1.6kg, the Philips GC4521/87 has a 300ml water reservoir that will enable you to steam iron many items before refilling is necessary. The Ionic glide sole plate creates less static and more glide on fibers and is scratch resistant. The position of steam channels and dimples gives maximum steam to your garments. 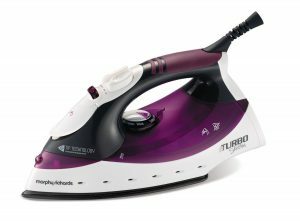 With 50g continuous steam and 200g steam boost, this iron packs a punch when it comes to overall steam output. There is a handy vertical steam function that allows you to iron out creases on drapes and hanging garments easily. What made this featured on our list are a few unique features that make it stand out from the rest of the iron pack. The GC4521/87 Azur features an auto shut off that shuts of after 30 seconds of non-use in the horizontal position and after 8 minutes in the vertical position. This feature is perfect for us forgetful individuals and indeed gives peace of mind. With the easy descale and reminder, as well as a deep clean function, you can get rid of any buildup that your water has created in your iron. This keeps your iron working for years to come. If you are looking for one of the best with virtually no downsides, the GC4521/87 is the right iron for you. 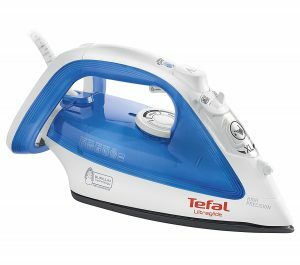 Last but not leafs we have the the Tefal FV4040 Ultraglide. With a very low price point, this iron is chalk full of features. You will have everything you need to make ironing more enjoyable if that is actually possible. The Tefal FV4040 comes with an amazing 3100w of power. It claims to heat up 15% faster than other irons, and we have to agree on the claim. This iron is quite light weighing 1.5kg, even when you fill the 270ml water tank with an extra-large filling hole. The 270ml water reservoir goes along way when you are using the 40g continuous steam feature. If you need a little extra moisture to get out those wretched wrinkles, use the 150g steam shot feature and they will disappear. The sole plate is a Durilium Tech sole plate with ultra glide diffusion. That jargon equates to one of the smoothest glides out there. The technology was invented by Tefal and is anti-scratch. There are extra steam dimples on the tip of the sole plate allowing you to give a good shot of steam to even the hardest to reach areas. With its Double Anti-Scale and self-clean system, the buildup will never be a problem. The FV4040 has anti-drip and auto shut off features and a 3m easy cord system to keep the cord out of the way. 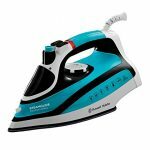 This is a fantastic iron especially for the price and with all the extra features. With no real negative attributes, you will be a happy ironer with the FV4040 Ultraglide!